I’m always grateful and astounded when others give me these nice awards and I’ve not acknowledged that so I thought I’d do that today and pass it along to other brilliant bloggers and writers out there. This is from High, Higher, Highest. Go visit this blogger who refers to herself as a perpetual perfectionist and has a J.M. Barrie quote on her blog: We are all failures…at least the best of us are. I like that. Thank you, HHH! Visit the award site (done) leave a comment (done), tell everyone who nominated you (done) and thank the blogger (done) and include a link back to their site (done). (BTW, if you don’t want to do any of this, you don’t have to, just put the award on your blog if you want to. 🙂 The bloggers below illuminate me in all kinds of ways. Some have lots of followers, others are just starting out, others always leave me wonderful comments and all are so appreciated. Go visit them and see if they’re your thing and give them some blog love. It’s from Sincerely Slapdash and Maggie from Someone Fat Happened created this oh-so-cool and brilliant award, Freshly Slapped! Thank you, ladies — you’re quite awesome. Go visit them — they’re funny and very creative. Finally, from Vikki from the The View Outside, I have the Sparkly Award. I guess I am pretty sparkly, especially after a couple of glasses of wine. ;). Thank you, Vikki. To all of you listed above, I’m giving it to you (including High, Higher, Highest and the male bloggers — c’mon you’re secure enough in your masculinity). Take it, own it and spread the sparkle. Try saying that after a couple of glasses of wine. Describe yourself in 7 words: Crazy, caring, self-deprecating, sensitive, soulful, kind, brave. Whom would you like to be? I am who I want to be right now. What scares you? Mean-spirited people and mice. What are the best and worst things about blogging? I get to write. Something I say may be misinterpreted and hurt someone’s feelings. If I could change one thing about myself, what would it be? My knees. Slankets, yes or no? I had to google this and H to the E to the double L, NO. Tell us something about the person who nominated you. She’s a very cool, kind and lovely person/writer from across the pond. Thanks so much to everyone that takes the time to give me these and to read my posts. I really appreciate it. I will introduce you to some other great blogs in the future and add to my blogroll in the coming days. One more thing: A special tribute to Nora Ephron, the incredible writer who left the physical world yesterday. She will be missed. You’re most welcome, Mags, I too have all her movies. xxoo. You’re welcome, J. Have a lovely day. :). Hey C–you’re welcome and you give me lots of smiles as well. I know the “what are your wearing thing,” just make something up and make it good. :). Sequins, tiara, hot pants, something like that maybe? ;). Emi! I just realized you weren’t included in that list and it is an OVERSIGHT on my part. I will fix that. I certainly meant to include you!!!!! What! Ah! Well thank you so much! 🙂 I’ll try to come up with a good response! 🙂 Thanks again and congrats! You’re welcome, Emi. Illuminate, sparkle and pay forward. ;). You are most welcome, JM. You always do put together nice posts. Wear the awards proudly — they really bling a blog. :). Oh, but I bestowed two — the Illuminating and the Sparkly. ;). And you’re welcome and thank you so much for your nice comment, Sue. hmmm… that’s like getting TWO desserts after dinner! I’m eating it up here! THANKS!!! Why thank you and so glad I helped you to smile. :). I’m honored, B. And you are indeed very sparkly. You earned that award in spades. And as always, you have a great list of blogs for me to spend the next few days with. Also, thanks for the shoutout to Nora E—I didn’t even know she had been ill until yesterday. May she RIP. Thanks so much MW. I know, one of the greats but her words live on. Your kind comments, as always, are so appreciated. :). You’re most welcome, Sara. Thanks for stopping by. :). Wow! Thank you! You must have endless patience, making a list of awardees that long! My lists always seem to be short, because I get distracted by shiny things. Like a sparkly award! Preeeeeeeeeeetttttttttttttyyyyyyyyyyyyyy …..
Aw shucks, I aim to please. I do have patience, as long as it’s something I wanna do. Glad you like it. ;). Congrats to all the winners, what wonderful awards! Call me sappy, but I love to see great bloggers recognized for their talents. Hi WML! That’s so very nice of you. That’s not sappy at all, that is very nice and thank you so much for stopping in to say so. :). Unfettered — you are too kind! Thanks so much for the reblog. :). Congratulations to you, Brigitte! And thank you for nominating me! I need a few quiet days now to go and investigate all the blogs you’ve mentioned here! Thank you for taking the time to spread some good blogging cheer! Hi Sally — thank you and you’re very welcome. :). Thanks Brigitte! I’m so flattered and thrilled to be on your list of fun blogs. The awards mean so much coming from someone of your caliber, sparkly, indeed! I always enjoy your posts and comments– you manage to be thoughtful and kind and yet you never lose your cool cat quotient. Congrats to you for being so loved and adored! Hi Grippy, you are fun and you’re so welcome. Oh, I love “cool cat” quotient. Who says stuff like that but way cool people. You rock and thank you. :). HA!! You’re most welcome — thank you. I know, sigh, whatta ya gonna do? I guess God had to make me humble some way — she’s a real prankster, she is. ;). Margarita, what a lovely thing to say and from what I’ve read, your prose is inspiring as well. Happy reading friend and you’re welcome. :). 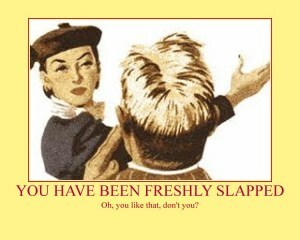 Congratulations on being Freshly Slapped! It is a well deserved honour that has been wisely bestowed. And oh look so many more blogs to be reading and enjoying! Ha ha! Thanks so much for that wicked slice of humor. Click on that little link and you can see what that’s all about. Happy to provide links to other blogs–maybe you’ll stumble across one you like. You have yourself a good day now. :). Hi Big Smile — thank you and hope you’ll take the awards bestowed upon you and spread it around. :). Thank you, H and you’re most welcome. Enjoy! :). Hi Teresa, now that sounds fun. Here’s to lots of great days and you’re most welcome. I’m right there with you and you’re welcome. :). You’re welcome and thank you. Have a nice vacay. :). 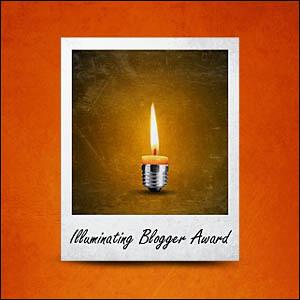 Awards – especially from a fellow blogger whose words I enjoy and respect…thank you so much. It means a lot to know that something I enjoy doing is being read and enjoyed. 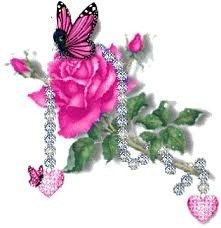 You’re very welcome, BB and it means alot to me as well — your comment and your following. Thank you! You’re welcome and it did. I don’t even know how to make/do/create a pinback. :). Thanks, Brigitte! I’m late, I know, but I’m playing catch-up. Thank goodness I bookmarked this, but I can’t believe I didn’t thank you! My bad, and my sincere apology (and THANKS!). You’re welcome. They are awards and should be done with and dealt with however you’d like. :). KV — you are too kind and you’re very welcome! !